Unfortunately despite our efforts to put the past behind us there will always be a few idiots who think they can destroy what others make. 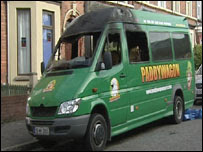 Last week, respected tour company, Paddywagon, had a second coach destroyed by fire in the last month. The fire was started deliberately and is suspected to have sectarian links. More here from the BBC. Northern Ireland is changing, progress is continuing but there is also a small number of people, who have no future and will have no future, so they take their frustrations out by destroying the good work of others. Its a disgrace but its not ususual.